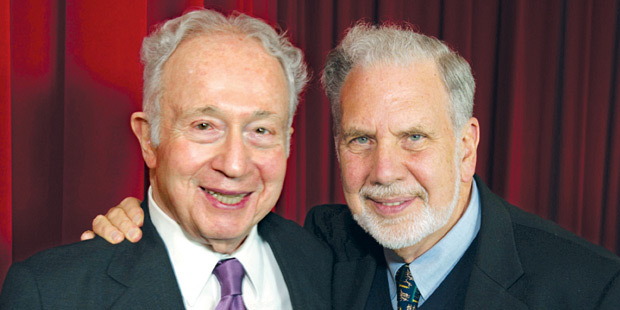 More than any others, Martin Lipton ’55 and John Sexton have guided the ascent of NYU School of Law as a top-tier law school and led NYU’s transformation into a global research university. Theirs is a partnership that has endured for nearly three decades, from 1988—when Lipton was elected chairman of the Law School Board of Trustees and Sexton dean of NYU Law—to the 2015–16 academic year, as they conclude their final year as chairman and president of the University, respectively. “My relationship with Marty is grounded in a deep respect that we have for each other and a deep love for NYU—first the Law School, later the University,” said Sexton in a video played at a tribute dinner for Lipton in June. “And both of us believed deeply that there was an exceptional character to NYU.” Sexton, who is also Benjamin F. Butler Professor of Law, is ending his tenure as president at the close of 2015 and will return to teach at the Law School. As dean of NYU Law for 14 years, Sexton recruited a number of high-profile faculty and pioneered the Global Law School model for teaching international law. In 2002, Sexton became president of NYU and commenced building what would become the hallmark of his ambitious presidency: NYU’s unrivaled global presence. The University opened two degree-granting campuses: NYU Abu Dhabi welcomed its inaugural class of students in 2010, and NYU Shanghai did the same in 2013; today NYU operates academic centers across the globe, from Accra to Prague. Along the way, Sexton tripled the University’s endowment and oversaw a merger with Polytechnic University.